Melaka, a small state formerly known as “Melacca”, is located on the West Coast of the Malaysian peninsular, about one and half hour drive from Kuala Lumpur (capital of Malaysia). It is indeed, a historical center with the best example of multicultural colonialism in existence. In the 15th century it was the largest port in South-East Asia because of its strategic location, though its importance has long since declined. Even until today, the city has fascinating examples of Portuguese, Dutch, Chinese and Islamic architecture throughout its rambling streets. 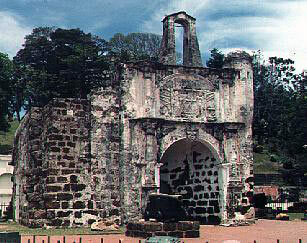 In 1396 Parameswara, the last malay ruler of temasik (ancient Singapore) founded Melaka. Finding it the place of strategic location, he had decided to make a permanent settlement there and named it “Melaka” after the name of the tree he leaned against. Over time, Melaka became an important port for western and eastern traders. Islam was later became the states religion in the 1400’s and Melaka itself became the centre of the religion throughout region. The Melaka sultans ruled the greatest empire in Malaysian history and the Malay language became the trading language in South-east Asia. In 1511, it fell to the hands of the Portuguese, and the Melaka sultan fled to Johor (the southern state of Malaysian Peninsular). Later, in 1641 the Dutch launched an attack on the city and it passed into their hands. The Dutch built many fine buildings and churches, which can still be seen today. Like the Portuguese, the Dutch only rules the area for about 150 years. In 1795, Melaka was given to the British to prevent it falling to the French when the Netherlands was captured during the Napoleonic Wars. It was returned to the Dutch in 1818 under the treaty of Vienna but was later exchanged by the British for Bangkahulu, Sumatra. From 1826 onwards, the British East India Company along with Singapore and Penang governed it, under the Straits Settlement administration in Calcutta.